How will Nobel handle Higgs hassle? 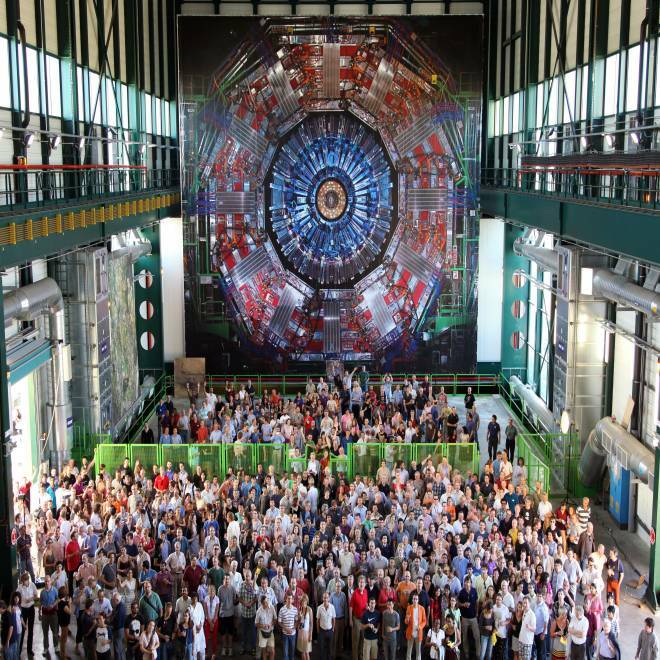 The Large Hadron Collider's CMS Collaboration gets its collective picture taken in front of a full-scale picture of the CMS detector at Europe's CERN particle physics lab. More than 3,000 scientists, engineers and students are involved in the CMS Collaboration, and just about that many more are involved in the collaboration for the LHC's other primary detector, ATLAS. The Higgs boson received nary a mention at this year's Nobel Prize proceedings — and although the Higgs hunt has been the biggest news in physics over the past year, there are good reasons for the silence. Next year, however, the Nobel committee could have a huge Higgs hassle on its hands. And maybe that's a good thing. Some observers think the conundrum surrounding a potential physics prize for the Higgs boson could lead the Nobel committee to make some long-overdue changes. And that, in turn, could change the public perception of how science is done. First, here's the main reason why this year's discovery of a "Higgs-like particle" wasn't Nobel-worthy this year, even though it validated a 40-year quest: The key breakthrough came to light in July, when the teams behind the Large Hadron Collider's two main experiments — ATLAS and CMS — declared that they had enough data to merit an official discovery of a new subatomic particle. That's well past the traditional deadline for nominations, and although deadlines can be bent, the findings still need to be firmed up. MIT physicist Frank Wilczek, who won a share of the 2004 Nobel Prize for his theoretical work on the strong nuclear force, said as much in an interview with LiveScience's Clara Moskowitz: "There are ways to stretch the rules, but evidently the relevant decision-makers felt that there was not sufficient reason to do so in this case." Wilczek added that a Nobel Prize recognizing the theoretical underpinnings behind the Higgs boson was "the odds-on favorite for next year." Usually, the committee in charge of awarding the physics prize waits until a breakthrough becomes so much a part of the scientific mainstream that there's no doubt about its truth and its value. That's the way it was this year, when French physicist Serge Haroche and American physicist David Wineland were honored for work in quantum optics that they pioneered 20 years ago. When it comes to the Higgs, however, the clock is ticking: British physicist Peter Higgs —who lent his name to the theory, the field and the particle that would explain the origins of particle mass — is 83 years old. Other contributors to the theory are of a similar age. The theory itself was developed in the 1960s, and the real marvel is that Higgs and his colleagues were proven so right, so long after they came up with the idea. But tradition dictates that the prize can be shared by no more than three individuals, who all have to be alive (although that rule was bent last year). Besides Peter Higgs, who should be in on the glory? Caltech theoretical physicist Sean Carroll, who has just finished a book about the Higgs quest titled "The Particle at the End of the Universe," says Belgian physicist Francois Englert is the best candidate for the second spot. Several others have valid claims on the third spot, however. And then, how about recognizing the thousands of physicists who worked on the LHC collaborations? This is the sort of quandary that has tied physicists in knots for years. Wilczek himself has said he's using the "no more than three" rule as a key plot device in a murder mystery he's writing, tentatively titled "The Attraction of Darkness." It's about a team of four physicists who discover the true nature of dark matter, and find themselves up for a Nobel Prize. "One of the four dies, supposedly a suicide, but then, maybe not," he told The New York Times. The way Carroll sees it, the Higgs hassle provides a perfect opportunity for the Nobel committee members to change their tradition — and ruin the premise of Wilczek's novel in the process. "They can do the right thing, and stop insisting that only three people can win it," Carroll told me. "Maybe that's something they can talk about over the next 365 days." Carroll isn't alone on this: This week, Scientific American's editors urged the Nobel Foundation to change its ways, either by merely throwing out the "no more than three" rule, or by allowing the prize to be awarded to groups as well as individuals. Etienne Klein, a physicist at France's Atomic Energy Commission, was quoted as saying the Nobel committee should "take a gamble" and award a Nobel to Higgs, Englert and Europe's CERN particle physics center, which manages the LHC. Columbia University's Peter Woit, the blogging mathematician behind "Not Even Wrong," favored going with CERN plus the ATLAS and CMS collaborations. Some might think recognizing groups rather than individuals would represent a dilution of Nobel prestige — but it can easily be argued that the change would bring the scientific prizes in line with the practice for the Nobel Peace Prize, which is routinely awarded to organizations ranging from the International Committee of the Red Cross (1917, 1944, 1963) to the Intergovernmental Panel on Climate Change (2007). The change could also shift the popular perception of the scientific process — away from the image of a scientist slaving away alone in a basement lab, and toward a more complex picture of scores, hundreds or thousands of researchers working together, connected via global networks. In short, the picture that actually reflects how science is usually done nowadays. Do you agree? If not, why not? If so, what's the best way to convince the Nobel committee to make a noble change? Feel free to weigh in with your comments below. Correction for 4:40 p.m. ET Oct. 11: I originally wrote that Belgian physicist Francois Englert was French. That error has been corrected. Pardonnez-moi s'il vous plaît!